• Polarized Sunglasses for everyone in your party. You don"t have to spend a lot of money on a pair for it to make a huge difference in your experience. Polarization makes it possible to see through the glare of the water surface to the structures below. This ability greatly adds to the Wow Factor of the ride through the shallow waters and increases visibility of the fish. You may actually see the fish take your bait! • If you are going to use sunscreen or insect repellent we recommend that everyone applies it before you leave your home or lodging for your trip. Make sure everyone gets their sunscreen and repellent off their hands. Nothing turns fish off more that a hint of sunscreen on a rig or lure. And it Kills Live Bait Quick! • Bug repellent may be necessary for the boat ramp area, mostly in the summer months. There is a good reason they call it Mosquito Lagoon. Generally bugs are not a problem after the boat leaves the ramp area. • Please bring your own beverages and snacks. Bring more water than you think you will need. You may bring your cooler. • For Cool Weather trips, dress in layered clothing. Remember the ride can be quite nip, even in warmer temperatures. • You should consider wearing a Hat and remember to bring your own Camera. We would love for you to share any pictures you have after your trip. How Many Anglers Can You Take? You can bring up to four anglers. Our boat is one of the few that can comfortably accommodate four anglers. If you have a larger party, we can arrange to provide other captains and boats for a Multi-Boat Charter. We need to know if you think your party wants to fish for four or six hours. • We will have enough bait and ice for your trip. • Your choice may determine where Capt. Karty decides to take your party. • And to allow for afternoon bookings. You may keep your legal sized catch. Capt. Karty does catch and release as well. Your catch will be filleted and in a bag at the end of your trip. How Far in Advance Do We Need to Book Our Reservation? The more advance the better, but we book trips for the next day often. Reserve as soon as your plans are finalized. How Can We Make Our Trip More Productive? Your fishing trip can be made more productive by accurate casting. You will want to help the other anglers in your party with this. Take a rod, with a quarter ounce weight tied on, to a grassy area. Practice aiming for a garbage can lid, Frizbee, Hoola-hoop, or similar item. Move around the yard and cast from different distances. Quiet Catches Fish! Of course, you can talk and play music. It is the heavy stepping and hatch slamming that spooks the fish and sends them scattering. Remind the others in your party before the trip to close the hatches gently and step lightly. It is helpful to remove the shoes of little ones. When you know fish are very close to the boat, you should even avoid making noise or shadow casting movements. 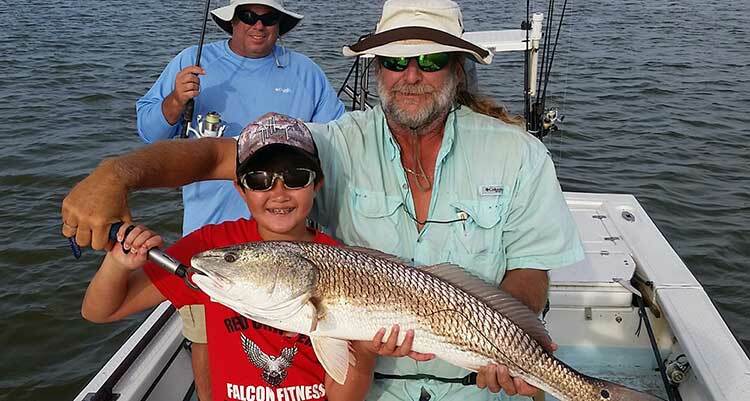 What's the Difference Between Offshore and Inshore Fishing? Offshore fishing includes trolling and bottom fishing. There is always the chance you will suffer from sea sickness and this type of fishing is passive. Capt. 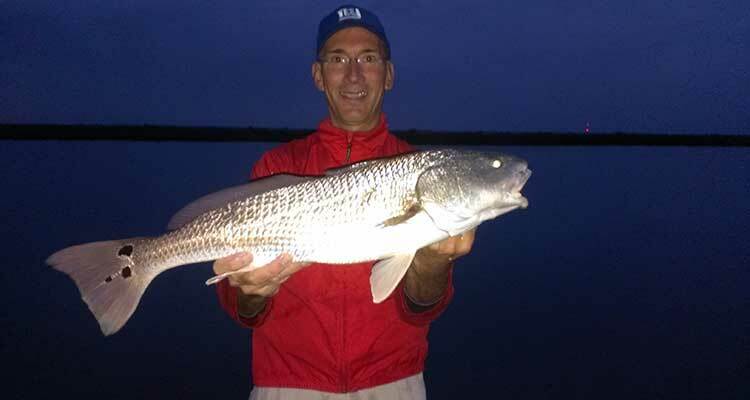 Karty has been providing inshore, backcountry or flats fishing since 1992. It's More Active Fishing - Stalking fish and, many times, seeing your fish take your bait. • There's lots of nature around. Over the years we have taken out many who have compared our trips to the offshore fishing trips they have taken. • Had More Fun with Capt. Karty than on their offshore trip. Capt. Karty knows just where to go to find fish and he helps just enough! Thank you so much for the Great day of fishing. We enjoyed ourselves sooo much. It was a day we will never forget. We all decided on the way home we could have fished that day till the sun went down. 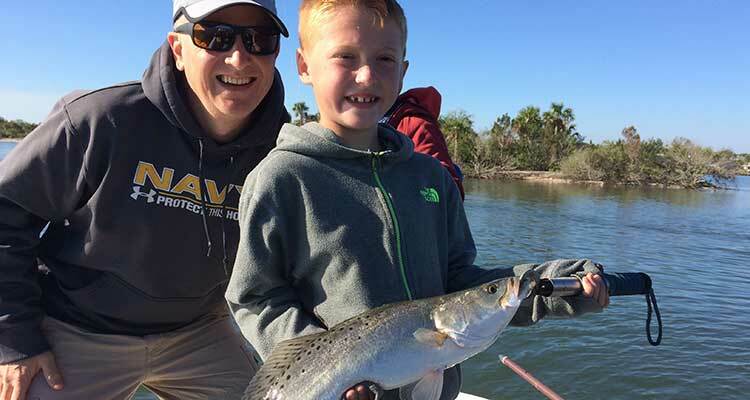 My sons and I went on our first fishing trip and are glad we chose Capt. Karty. It was a terrific experience and we would do it again in a heartbeat. We had a scenic fishing tour of the lagoon. 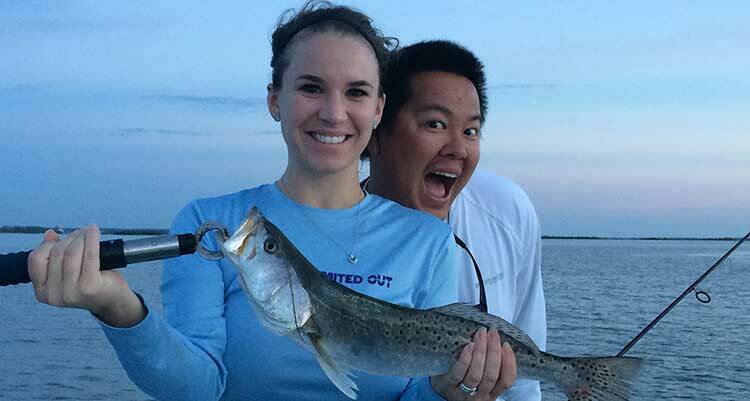 Great fishing for redfish, a beautiful day and dolphins, manatees and birds to boot! The weather forecasts here are notoriously wrong. Read that again. Notoriously wrong. The majority of our trips are concluded before noon and most foul weather or afternoon storms don't affect us. Please do not put much faith in local weather forecasts. They are talking percentages and a large percentage of our trips are completed without rain or foul weather. Trips may be postponed an hour or two when warranted to allow for the occasional morning shower. Karty finds that trips after morning showers are predominantly great trips. The barometric pressure changes and the fish turn on. The rain also discourages others from joining us. Keep in mind that the most beautiful day on the water may not be one of the most productive. Cloud cover and low winds may contribute to the fish biting. Capt. Karty is awake in the wee hours to prepare for your trip. If the weather, at that point looks nasty, he will postpone or cancel. If you are traveling a distance, we will try to let you know before you begin your drive. If you cancel before the day of your trip, it will cost you $100. If the weather is truly not fishable, Karty will cancel on the day of your trip and you will owe nothing. We would love nothing better than for you to enjoy a gorgeous day out on the water. We will do everything we can to make this happen for you. Trips are weather cancellable by the Captain only, only on the day of your trip. If you do not call to cancel, and Capt. Karty is left waiting at the ramp for you, we will charge $200 as the deposit guarantee. Capt. Karty just wants to fish. That said, we will certainly attempt to rebook your date. If we cannot, we reserve the right to charge up to $100 per trip cancelled. We take each situation individually and try to be extremely fair and have very rarely charged for cancellation. If we turned down a trip due to your reservation and we do not rebook, you will be charged the $100. If you fail to call or show up, you will definitely be charged the $200. Can We Meet at Canaveral National Seashore? Canaveral National Seashore is located at the southern end of A1A in New Smyrna Beach. The cost is $5 for you to park. You need to park on the east or ocean side of the road and walk over to the boat ramp located near the trailer parking area on the west or lagoon side of the street. Pick-up at Canaveral may be more convenient for you. However Karty recommends Riverbreeze Park for several reasons. Karty starts most of his warm season trips at daybreak. His bait pick-up is usually south. It takes travel time to get to Canaveral and to get bait and then to head to the first fishing spot. This travel time coincides with prime fishing times of the day and he would rather you spend this time with your bait in the water. We never know when fog will occur but it can really slow things down when Canaveral pickups are involved. Due to fuel and the time involved, there is a charge $20 for a Canaveral Pick-up.